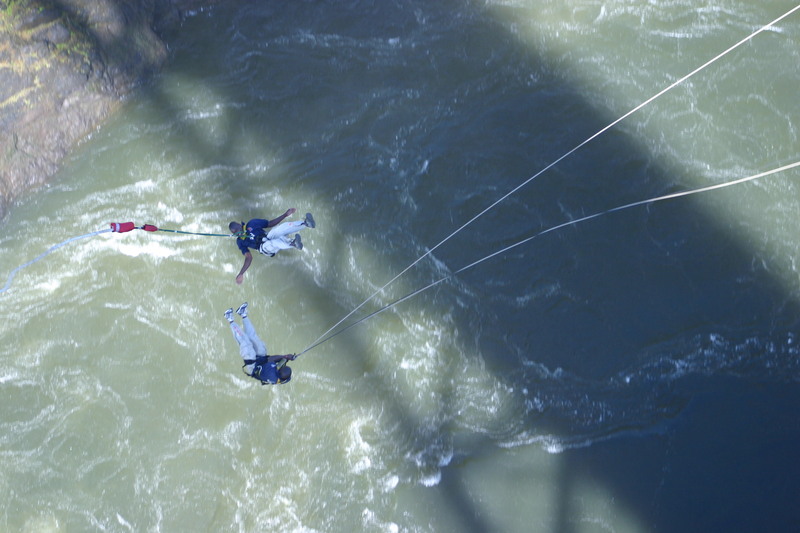 From recent experience we would say “DEFINITELY EXTREME.” There is nothing more terrifying than standing on a seemingly fragile platform 111m above the gorge at Victoria Falls, Zimbabwe, staring down (I know I know – you should NEVER look down, but try remembering that when you have just realised what you have signed yourself up for!) at raging waters way way below whilst the realisation of what you have committed yourself to slowly sinks in. 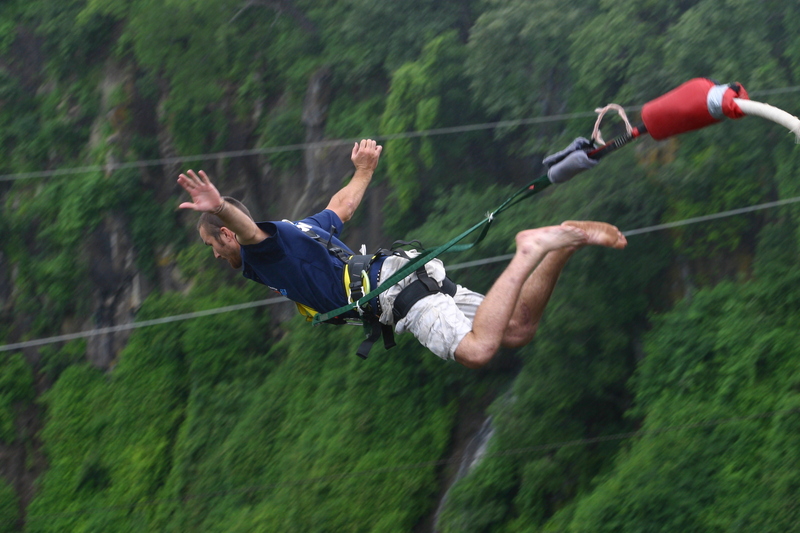 Now this sounds like I did the bungee jump doesn’t it? I didn’t. Fortunately, and here I heaved an ENORMOUS sigh of relief, you are advised not to jump if you suffer from a weak shoulder, weak knee, a heart condition or any neurological problem. I, happily, suffer from a dislocating shoulder caused by a body-surfing accident some years ago. 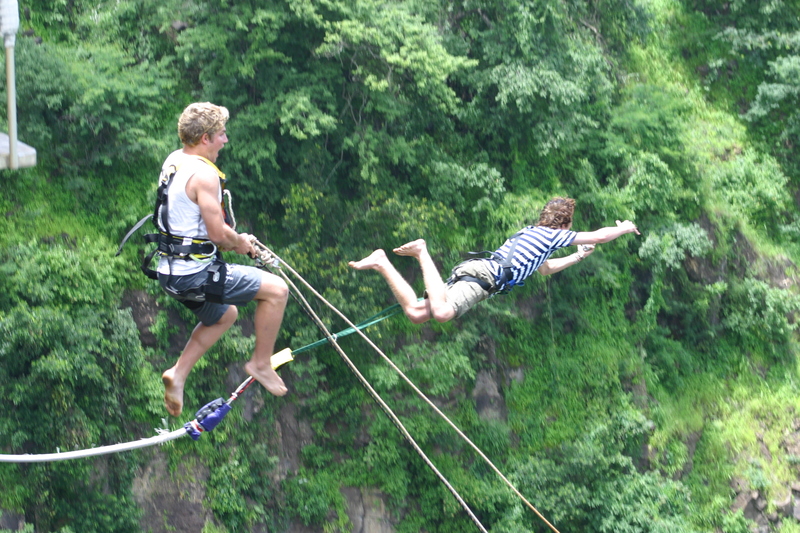 The Victoria Falls Bungee jump, at 111m, used to be the highest commercial bungee jump in the world, but it now takes second place behind Bloukrans River Bridge in South Africa which is a 160m bungee, though the gorge itself is 216m! However, and here I may be a little biased, the Vic Falls jump is still the most spectacular and is probably (almost definitely!) the most superb setting in the world. The bridge lies in “no mans land” between the Zimbabwean and Zambian Border Posts. To one side are the Falls themselves – one of the Seven Wonders of the World and a World Heritage Site, on the other side is the turbulent Zambezi constricted within the narrow walls of the gorge. 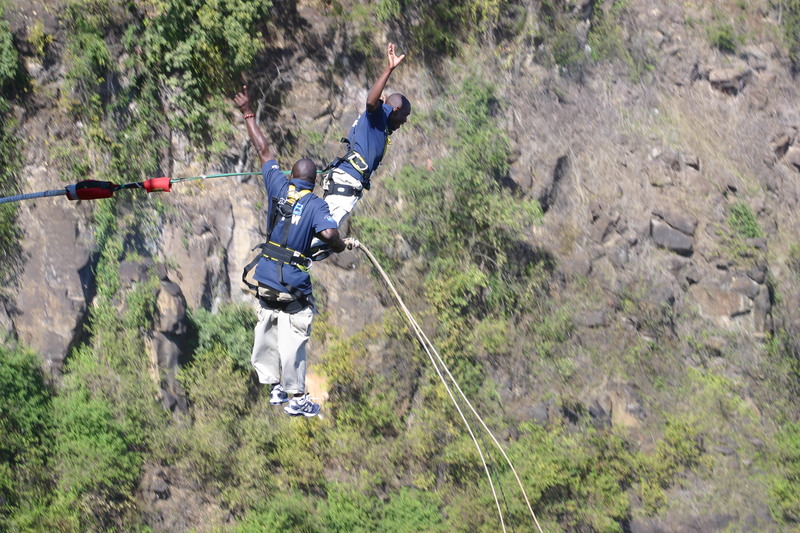 The Big Air Company at Victoria Falls, ably run and managed by Garth Fowler, is a wonderful place to bungee jump. It has a 100% safety record – and is open 365 days per year. There is a rigorous adherence to safety standards. You may be confident in the knowledge that you are always in a safe, professional and controlled environment – even though you appear to be surrounded by a bunch of humorists! The joking, joshing and general pulling of one’s leg never ends and certainly makes the leap easier. Waiting on the bridge with you are several other about to be jumpers – whether it’s bungee or the swing. Some don’t look so keen, but others are already zinging with anticipation. The guys preparing you for the jump are fantastic. There is a lot of banter, a lot of jokes, some extremely black humour as you can imagine… “when you get back, IF….” and “do you trust me? – how can you trust me if you don’t know me?”; or “do you want to know my name? I’ll tell you if you get back. Oh, you want to know now incase you don’t get back? OK, it’s Junior Mugabe – NOW do you trust me?” !!! etc. But at no time do they push you into doing something that you don’t want to do. If you get to the edge, toes gripping the platform, shoulders hunched and the whole body straining away from the drop, they talk calmly and encouragingly to you and allow you to step away from the breach without losing face. There will be more on this wonderful place later but thanks to Garth and The Big Air Company for allowing me to use their photographs. Hey Sarah. 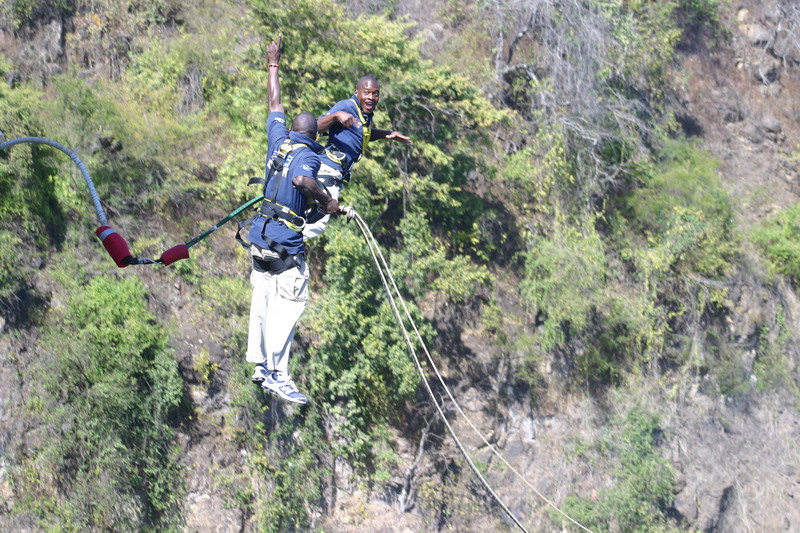 Sha what happened to me… I also jumped off..
Hey Bron, nice to hear from you. I know, and you were the bravest of the bunch! I’ll do an article just on your jump one day! Do you have the video? 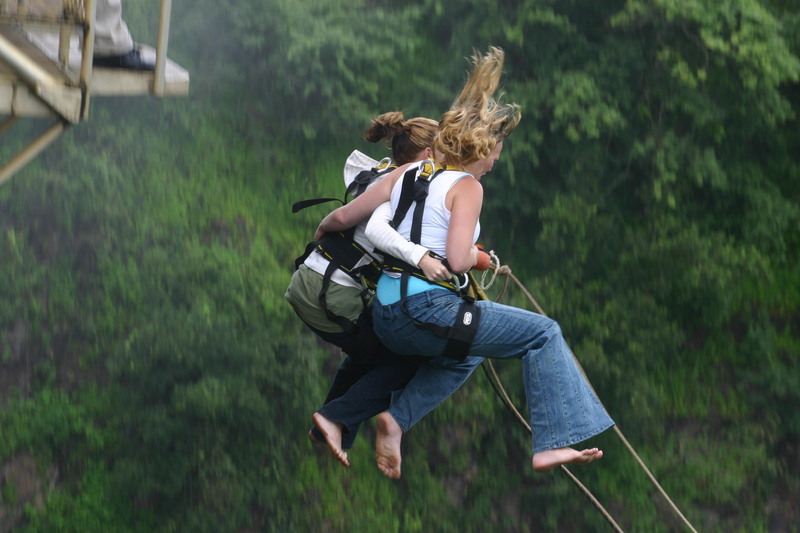 Please be advised that the Victoria Falls Bungee is now open after independent inspectors gave a green light to start operations. Brilliant – I’ll put out a note to that effect. Thanks for letting us know.